Chris Mans from Jeweled Nails, a salon and academy in Lake Forest, Calif., shows how he created rustic-themed sakura (cherry blossom) bridal nails with baby blue as a wedding color. 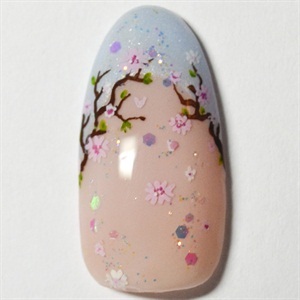 Chris Mans from @Jeweled Nails, a salon and academy in Lake Forest, Calif., shows how he created rustic-themed sakura (cherry blossom) bridal nails with baby blue as a wedding color. 1. 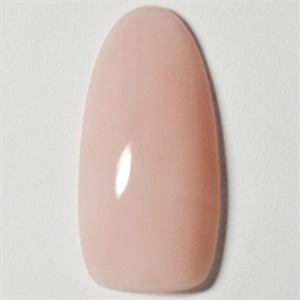 Apply an opaque cover pink to the entire nail to elongate the nail bed. 2. Use a baby blue with a hint of shimmer to paint a high thin French. 3. Paint brown branches from both sides of the nail, do not let them connect. 4. 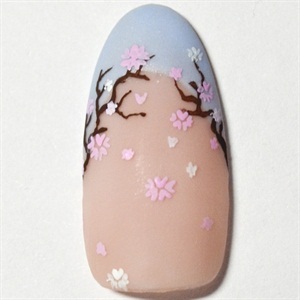 Paint light pink and white cherry blossom flowers of different sizes on the branches and falling down the nail bed. 5. Use a darker pink to make tiny dots inside the blossoms and add some green leaves on the branches. 6. Finish the design with some translucent glitter in various sizes randomly over the nail.